Phil Hamilton (centre) pictured with RSPCA ambassador Matt Johnson (left) and Love Island star Amber Davies. An RSPCA officer who has dedicated his career to rescuing and caring for thousands of exotics has received a prestigious Animal Hero Award. Berkshire-based Phil Hamilton received his award at the glittering Animal Hero Awards ceremony in London. Now in its sixth year, the event recognises inspiring acts of bravery, dedication and resilience in the animal world. Phil received the RSPCA Superstar of the Year award in honour of his dedication to changing the way exotic animals are treated. During his working life, he has rescued and re-homed a number of animals including a chameleon, blue-tongued skink and a Sulcata tortoise named Horace. 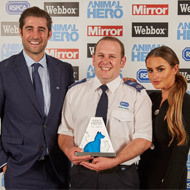 Receiving the award from TV presenter and RSPCA ambassador Matt Johnson and Love Island star Amber Davies, Phil said: “This award is such an honour. I am very chuffed. I was not expecting it. “Reptiles and exotic animals are very much misunderstood and I wanted to make a difference to the lives of these sorts of animals. I love my job, this is such a rewarding role. I could not imagine doing anything else. Whilst working for the RSPCA, Phil has attended rescues ranging from lizards on the loose, emus being kept in back gardens and racoons living in sheds. Dr Ros Clubb, a wildlife specialist and senior scientific manager at the RSPCA, said: “There is a growing problem with the amount of exotic animals being rescued by the RSPCA and a shortage of places to house them. “Phil takes on the role of coordinating the RSPCA's team of specialist Exotics Officers. He's a mine of information about exotics and he has a huge passion for helping these animals.